Luxury home in Lake Las Vegas have special semi custom home pricing. 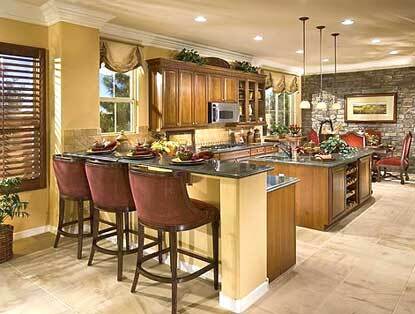 During the buyers market you can take advantage of this savings on standing inventory of new homes at Bella Fiore. Standing inventory at Lake Las Vegas includes a Plan Three C with a pool sized lot. The four bedrooms, 3.5 bathrooms, bonus room, library and three car garage home measure 3,959 square feet. Homes for sale in Las Vegas real estate fall to $77 per square foot. A new floor plan offered by Harmony Homes is located in their Harmony Pointe Collection in North Las Vegas. The new North Las Vegas homes offer their largest floor plan with five bedrooms and three bathrooms. The new home is 3,023 square feet with large living areas. Residential real estate in Las Vegas, NV prices median home prices decline that haven’t been seen for six years. Prices were looking good for the end of Dec. 2008, but prices and sales took a dive. Median Las Vegas home prices fell to a record low in 2003. The January price was a 8.6 percent decrease from Dec. and year to date huge 36 percent decrease. The Greater Las Vegas Association of REALTORs or, GLVAR, show a 126.2 percent gain of year to date totals, but fell 11 percent from a month earlier. Home sales levels topped 2,000 at May and finished the year at the same level. Las Vegas real estate market update and resale home sales for December 2008. The Greater Las Vegas Association of REALTORS reported median home prices fell 32.7 percent and home sales went up almost 300 percent from a year ago. Buyers are realizing that it is a great time to buy property. Good news to report that during this time of economic crisis the monthly residential real estate sales continues to increase. Traditionally December is a slow month for sales, but not for Dec 2008.